Miracle babies, wounded soldiers, and hurricane victims: Grim and uplifting articles about hospitals. The Longform guide to hospitals. 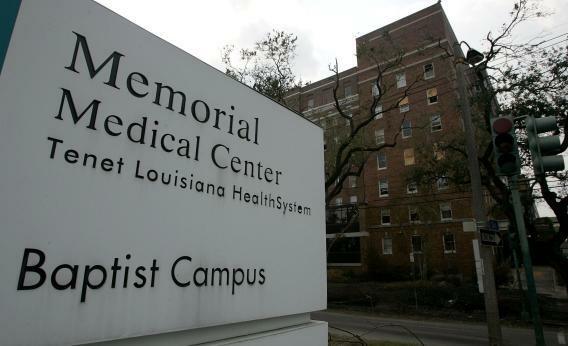 A sign is seen in front of Memorial Hospital in September 2005 in New Orleans, where 45 patients were found dead after Hurricane Katrina evacuation efforts were thwarted and temperatures inside the hospital reached 106 degrees. After Katrina’s floodwaters knocked out power and marooned New Orleans’ Memorial Medical Center, evacuating all the hospital’s patients seemed impossible. Following the controversial choices of the medical staff who tried to “do the greatest good” with no triage procedures in place. “Gremillion’s supervisor and friend, a LifeCare nursing director, Gina Isbell, told me she walked into the room around 11 a.m. and saw Gremillion crying and shaking his head. He brushed past her into the hallway, and Isbell followed, grabbing his arm and guiding him to an empty room. ‘I can’t do this,’ he kept saying. “‘Yes, they are,’ Isbell remembers Robichaux, in tears, saying. ‘Our patients aren’t going to be evacuated. They aren’t going to leave.’ As the LifeCare administrators cleared the floor of all but a few senior staff members, Robichaux sent Isbell to the back staircase to make sure nobody re-entered. It was quiet there, and Isbell sat alone, drained and upset. Isbell said she thought about her patients, remembering with guilt a promise she made to the daughter of one of her favorites, Alice Hutzler, a 90-year-old woman who came to LifeCare for treatment of bedsores and pneumonia. Isbell fondly called her Miss Alice and had told Hutzler’s daughter that she would take good care of her mother. Now Isbell prayed that help would come before Hutzler and her other patients died. On David Arndt, a prominent Boston surgeon famous for leaving a patient in the operating room while he went to cash a paycheck. “The central character in Oscar Wilde’s The Picture of Dorian Gray manages to defy age and remain youthfully handsome. But he loses his inner compass. In the end, Dorian Gray pays dearly for his vanity. Inside Landstuhl, the single German hospital where every American soldier wounded in Iraq or Afghanistan is treated. After their daughter was born with a deadly bone marrow disease, Lisa and Jack Nash became the first parents in history to genetically engineer a child in order to create a donor for her. The story of saving 5-year-old Molly and the public debate that followed. “At 1:20 p.m. on Tuesday, Sept. 26, 2000, a nurse walked into Molly’s room carrying a bag of her new brother’s blood. A rabbi joined the family to bless Molly’s ‘new life.’ While the slow, syrupy-thick drip began, Molly’s family sang happy birthday—what everyone hoped would be the beginning of the rest of her life—and snapped pictures. Molly’s baby brother, not even a month old, sat on her lap. “Jack could smell the blood. It smelled like creamed corn. Looking on, the mother in Lisa thought, ‘You expect thunder and lightning and miracles.’ But the nurse in her saw it was only a bag attached to a central line. The Nashes watched the clock. The transfusion—so many years in the making—lasted just 25 minutes. The family ate forkfuls of cake emblazoned with ‘Happy Transplant Day.’ Molly looked no different. No thunder. No lightning. After 19 years, a doctor confesses about his time harvesting organs from political prisoners in China. Apprenticing aboard an ambulance with veteran paramedics. “Before my first shift, I worked my way through the bags with a paramedic named Suzanne Noël. It was impossible to cover everything that might happen on a given shift—broken bones, strokes, childbirth, heart failure, brain injury, gunshot wounds, stab wounds, toxic shock—or where the drama might take place: in a bedroom, a bar, or a car upside down in a ditch. It’s a job that requires a free kind of spirit, and like most paramedics I met, Suzanne was bright-eyed and quick to smile. ‘Seeing what we see, we know how lucky we are to be alive,’ she said. On his deathbed, a longtime Harper’s contributor considers the state of ethics in America. “Without ethics, politics has no limits. America broke the rules of living systems, and lost its balance. All the oxygen flowed to a smaller and smaller section of the body politic. The history is brief and unquestionable: close to toppling, the society momentarily pulled itself upright, and then became even less ethical, less balanced, more endangered than ever as a lawless financial system came back from death, and like a foolish patient after a heart bypass operation, continued in its old ways. With no ethical component to national politics, President Obama could deliver his 2011 State of the Union speech without ever mentioning the word ‘poverty,’ although one in every five American children lived in poverty. Without a commitment to Hutcheson’s idea of the greatest good, which is at the core of the original American philosophy in Jefferson’s drafting of the Declaration of Independence, this may no longer be the brilliant experiment. If happiness is for the few and it produces unemployment approaching that of the Great Depression, then the shadow of evening is here. On the decline of the American autopsy and the fallibility of modern medicine. “I felt her abdomen. It could be anything, I thought: food poisoning, a virus, appendicitis, a urinary-tract infection, an ovarian cyst, a pregnancy. Her abdomen was soft, without distension, and there was an area of particular tenderness in the lower right quadrant. When I pressed there, I felt her muscles harden reflexively beneath my fingers. On the pelvic exam, her ovaries felt normal. I ordered some lab tests. Her white-blood-cell count came back elevated. Her urinalysis was normal. A pregnancy test was negative. I ordered an abdominal CT scan.